McAfee Security for Microsoft SharePoint (MSMS) ensures that your corporate SharePoint deployment does not spread malware, store inappropriate content, or lead to data loss. Microsoft SharePoint, a widely deployed tool to share and store business information and content, does not block malware or inappropriate content — a risk for organizations that are unable to ensure SharePoint users have the latest malware protection in place. MSMS delivers industry-leading protection to prevent the server from inadvertently becoming a security hazard. Specialized SharePoint security — MSMS adds a critical layer of anti-virus protection and content filtering to ensure you achieve all the business benefits of SharePoint without any of the associated security hazards. Simpified deployment and management — MSMS interfaces with SharePoint using the recommended security architecture via the SharePoint VirusScan API and SharePoint Object Model. Deploy MSMS on all SharePoint web front-end servers in your SharePoint farm, individually deploy and manage MSMS on the SharePoint server, and centrally deploy and manage MSMS through the McAfee ePolicy Orchestrator (ePO) platform. MSMS works with SharePoint 2003, 2007, and 2010, giving you continued protection even in diverse environments. Integrated with industry-leading anti-malware technology — McAfee Artemis Technology is the first always-on, real-time protection that secures enterprises and consumers from threats as they strike. Its Global Threat Intelligence blocks malware, stops data theft, and prevents damage to your systems before virus signature updates are even available, reducing the protection gap, decreasing false positives, and strengthening endpoint security without additional cost. Your business depends on collaboration. Systems such as Microsoft SharePoint Servers enable you to share information effectively and deliver more value to your employees, partners, and customers. Now you can secure these systems with McAfee® Security for Microsoft SharePoint software so that they don’t become vectors for viruses, malicious code, inappropriate content, or information loss. Manage McAfee Security for Microsoft SharePoint software and your other McAfee security products with the McAfee ePO platform. Deploy, configure, administer, and report with one powerful, centralized console. Use the award-winning McAfee scanning engine to detect, clean, and block viruses, worms, Trojans, and other potentially unwanted programs. Get lightning-fast scans and reduce performance impact. Benefit from McAfee GTI file reputation service, which provides a comprehensive global threat intelligence network with instant detections before signatures are released. This decreases false positives through instant comparison of millions of genuine whitelist files. Prevent SharePoint from becoming a malware vector. Block viruses, worms, Trojans, and other potentially unwanted programs. Stop data theft and prevent damage to your systems before virus signature updates are available. Use preset content management rules to prevent unauthorized or inappropriate documents from being stored on your SharePoint server. Report details about documents that contain sensitive or offensive information. Simplify security management. Centralized and local reporting via the McAfee ePolicy Orchestrator (ePO) platform provides visibility of infections and content policy violations. Ensure real-time protection when content is accessed and schedule deep scans of all data using the latest malware and content filtering signatures. Opt to limit full repository scans only during scheduled maintenance windows or choose one or more scan targets, including web applications, websites, folders, and specific file types. Reduce overhead by choosing to scan only new files. Use prebuilt dictionaries that cover most enterprise- and country-specific compliance rules or customize content filters to keep sensitive data from leaking out of your organization. Create rules on a global basis, with exceptions as needed for individuals and departments. Manage via the built-in HTML interface or the McAfee ePolicy Orchestrator (McAfee ePO) platform. Enable preset rules to immediately prevent the spread of inappropriate content, or fine-tune policies with advanced custom rule sets for maximum flexibility. Store quarantined documents locally and search the database by infection name, file name, and other parameters. Use the ePO platform to gain visibility of infections and content policy violations. Comprehensive, detailed graphical reports help ensure all SharePoint servers are protected with the latest virus definition files. McAfee antivirus technology with McAfee GTI file reputation technology blocks viruses and malicious code threats and offers real-time security using a combination of signature and behavior analysis with community threat intelligence. It drills down to find threats in compressed files with advanced heuristics and generic detection. It even finds and blocks new viruses before they are detected with the latest .DAT signatures. Continuous protection is yours with defense in depth through real-time on-access scanning and the ability to schedule periodic deep scans of all data using the latest malware and content filtering signatures. Opt to limit full-repository scans only during scheduled maintenance windows, or choose one or more scan targets, including web applications, websites, folders, and specific file types. Reduce overhead by choosing to scan only new files. Apply rules to more than 400 types of documents, including Adobe Acrobat and Microsoft Office. Using the McAfee Security for Microsoft SharePoint software content rules, you can prevent inappropriate or unauthorized content downloads and uploads. Additionally, you can prevent data loss through flexible content filtering and ensure that only valid business assets are stored in SharePoint. Because McAfee Security for Microsoft SharePoint software integrates with McAfee ePO software, you can manage it and other McAfee security products from a single console and create detailed graphical reports. Prevent the spread of inappropriate content with preset content rules. Start immediately, and finetune them later with advanced custom rule sets. McAfee Security for Microsoft SharePoint software uses Microsoft VSAPI technology and the Microsoft SharePoint Object Model to protect your SharePoint Server. Update virus definitions and engines to ensure that protection is up to date. Integration with McAfee GTI file reputation provides real-time detection of viruses within milliseconds. McAfee Security for Microsoft SharePoint software now stores the quarantined documents locally in a PostgreSQL-based database. The quarantine is associated with added search functionality based on infection name, file name, and other parameters. Documents, files, web content, and information stored in SharePoint are critical to your business and must be secured. McAfee can help. McAfee Security for Microsoft SharePoint software secures the information that makes your business productive by detecting, cleaning, and removing malware and banned or inappropriate content stored in your SharePoint workspace. McAfee Security for Microsoft SharePoint software offers preset data loss prevention (DLP) content rules to prevent leakage and access of unauthorized content. Easy-to-use and immediately effective preset DLP content rules can be run out of the box, and you can fine-tune them using advanced custom rule sets. DLP and content management rules can prevent downloads and uploads of documents and report the details about documents in your repository that contain sensitive or offensive information. McAfee Security for Microsoft SharePoint software leverages your security investment in the McAfee ePolicy Orchestrator® (McAfee ePO™) management platform. McAfee ePO software optimizes your security investments and delivers quantifiable operational efficiencies in your environment, extending to both physical and virtualization platforms. Comprehensive, detailed, graphical reports from McAfee ePO software inform you of your security posture and answer the question: “Are all my servers protected with the latest engine and virus definition files (.DATs)?” McAfee ePO software provides remote deployment and configuration, and large enterprise rollouts can be easily managed from a central location. The McAfee Security for Microsoft SharePoint software dashboard provides an overview of the latest detections; graphical views with multiple charts, detection summaries, product updates, licensing, and version information; and details on recently scanned items. 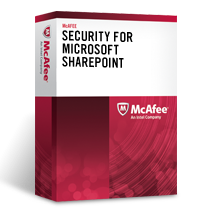 Download the McAfee Security for Microsoft SharePoint Datasheet (PDF).